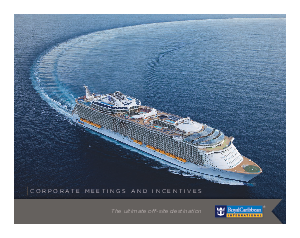 Your CFO will be ecstatic: On a Royal Caribbean International® cruise, most meals and amenities are included. Compare that with the à la carte pricing of land-based hotels and resorts where the charges keep adding up. For the person in your company who's watching the bottom line, it's the best value anywhere. Period. Your Planner will be relieved: Once your company books a cruise, the job of planning is just about over. Meals? Already taken care of. Activities and entertainment? Done. Production and décor? Covered. And our coordinators will work with you to further enhance your program. Download this Meeting, Incentive & Charter Brochure for more information about how you can create an unforgettable experience for your employees today.